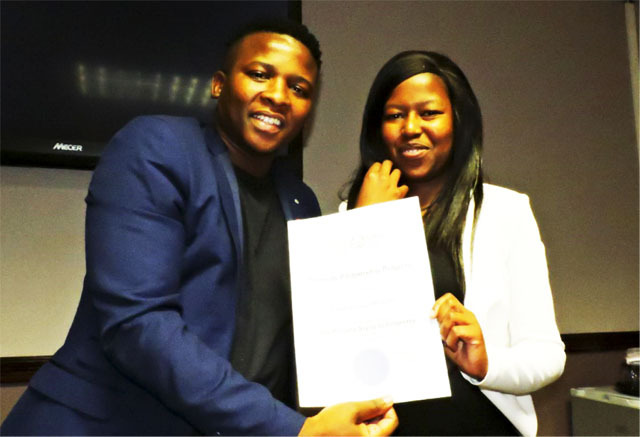 Caption: Bloemfontein – On 23 August 2017, Columba Leadership celebrated the award of a newly established international scholarship to one of its brightest young leaders, Keabetswe Malebo (right), featured next to Moses Xaba, Columba Free State Acting Provincial Manager. The scholarship was established to allow economically disadvantaged young women of strong character to achieve their potential through higher education. The scholarship will cover all the costs of Keabetswe’s studies at The University of Free State (UFS) including tuition and fees, accommodation, food, textbooks and a laptop. 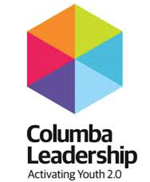 Columba Leadership is a values-based leadership programme developing responsible leaders and employable young people. Columba has worked in the Free State for the last 5 years – working in 21 schools in the province, and unlocking the potential of hundreds of young leaders. The scholarship was created by Abbe Levin, a noted American business owner, in partnership with Columba Leadership and the UFS School Partnership Programme. It celebrates the memory of Ida Manana, a woman from Bloemfontein who emigrated to the USA and became an integral part of her local community. Although she started with only a rudimentary level of education, Ida constantly strove to improve herself, mastering both literacy and numeracy. She always made time to help people in her adopted community in Washington DC, where she first met Levin and the two became friends. Deeply touched by Ida’s determination and unshakeable character, Levin decided to set up the scholarship in memory of this extraordinary person. 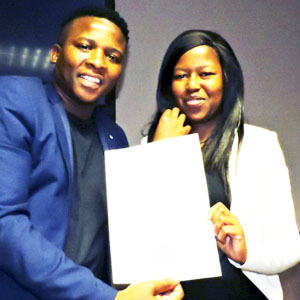 Keabetswe was selected from over a hundred applicants from schools throughout the greater Bloemfontein area. She participated in the Columba Leadership programme at Sediti High school in Thaba Nchu and impressed everyone she encountered with her confidence, strong character and service ethic. “Our selection process was quite rigorous,” said Moses Xaba, Columba Free State Acting Provincial Manager. “Applicants were screened for academic performance and assessed on their leadership and service record within the Columba Programme. Finally, the remaining finalists were interviewed by a panel of representatives from Columba and the University of Free State,” he continued. “Keabetswe impressed all of us with her strong work ethic, her leadership skills and her passion for serving her community,” continued Xaba. “She was the obvious choice for this scholarship. We are proud to have her as our inaugural winner,” he stated. Keabetswe’s success is particularly striking given that she has overcome considerable hardship along the way. Her mother is deceased and her father is absent, leaving her grandmother to raise her and two siblings. She attributes much of her character to her grandmother, who has inspired her to strive to improve her life, and the lives of those around her. She plans to study law at UFS and eventually to set up her own firm as a way to both serve society and create much-needed jobs. For more information about Columba Leadership (www.columba.org.za) contact Rob Taylor at rob@columba.org.za or 083 326 1004. Founded in 2009, our mission is to build a national movement of ethical leaders for youth employment and enterprise, unlocking the future growth potential of South Africa and building a more equal society that we all want to live in. We develop the character of young leaders in schools using ethical values. Supported by their educators and principal, they form teams with school friends and run action learning projects to fix challenges they face in their schools and communities. They all learn important skills like critical thinking, collaboration, communication and resilience, and introduce the spirit of enterprise into schools. Young leaders become role models of active citizens and make a big contribution to improving discipline and learning in their schools. We train educators, cluster schools and align with education department processes so that schools maintain the impact after we have gone.